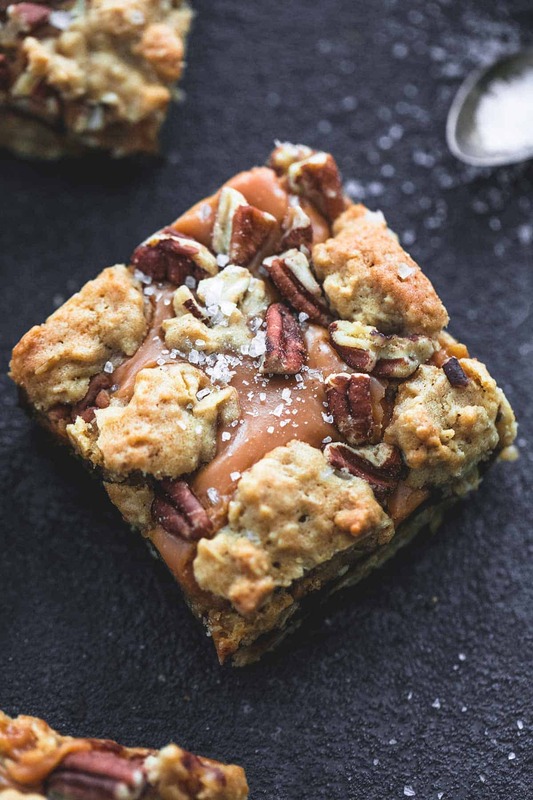 Gooey, sticky and just 15 minutes of easy prep time, these Salted Caramel Pecan Oatmeal Fudge Bars will leave you wanting to make these for every occasion from birthday to BBQ! I might like cookies better than bars. In most cases anyway. If you can turn a cookie I like into a thick bar, chances are I’m going to be even more crazy about the bar version than the initial cookie version. 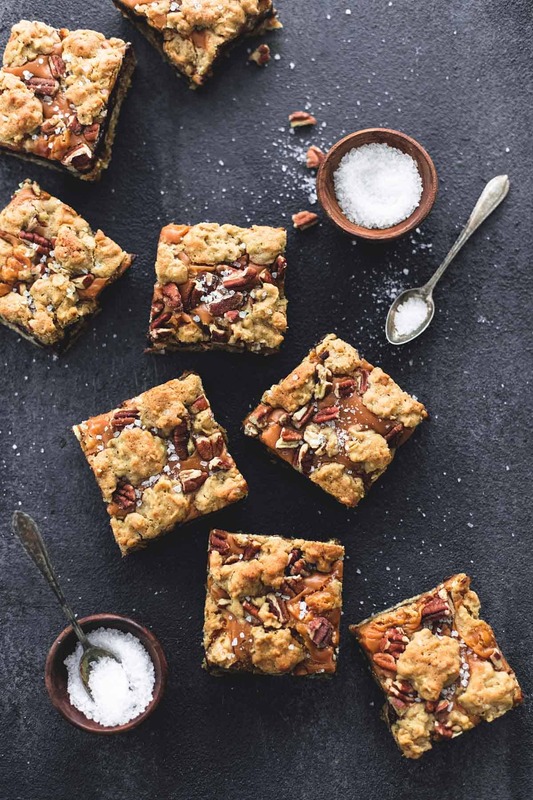 Case in point: these oatmeal cookie bars. But then again they have a lot going for them on top of the oatmeal cookie dough part. So let’s talk about all of these layers. 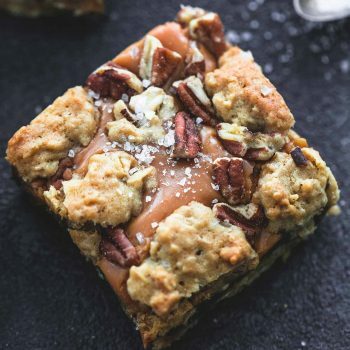 So think oatmeal cookies but a whole heck of a lot better with the addition of fudge and caramel and sea salt and pecans. Now stop thinking and get to the making and the eating part. Preheat oven to 350 degrees. Line a 9x13 inch pan with foil and grease with cooking spray. Cream together butter and sugar until light and fluffy. Add eggs, vanilla, and milk and mix until combined. In another bowl stir together flour, salt, and oats. Combine wet and dry ingredients and mix well. Spread 2/3 of the batter into the bottom of your prepared pan. In a microwave safe bowl combine caramels and heavy cream and microwave on high for 2 minutes. Stir and return to microwave 20 seconds at a time, stirring after each, until smooth. Pour over fudge layer. Drop teaspoons of remaining dough over the caramel until remaining dough is used up. Sprinkle sea salt and pecans over the top. Bake for 25 minutes. Allow to cool completely before cutting into bars. 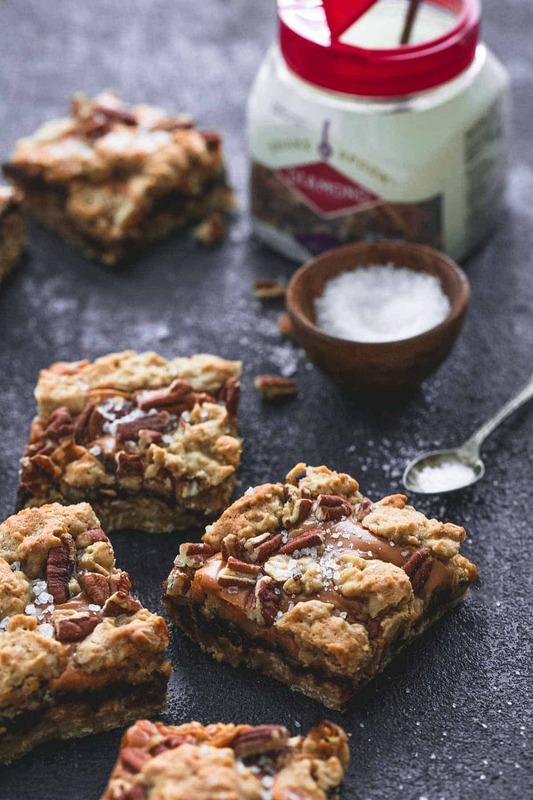 This tasty bar recipe was sponsored by Diamond Nuts – thanks for letting me work with the brands I love! hey girl -yummy! This is right up my alley! I like both cookies and bars and these looks yummy with all the different layers of texture! I am in love with these bars. All of my favorite flavors (and thankfully no raisins!) in one place! 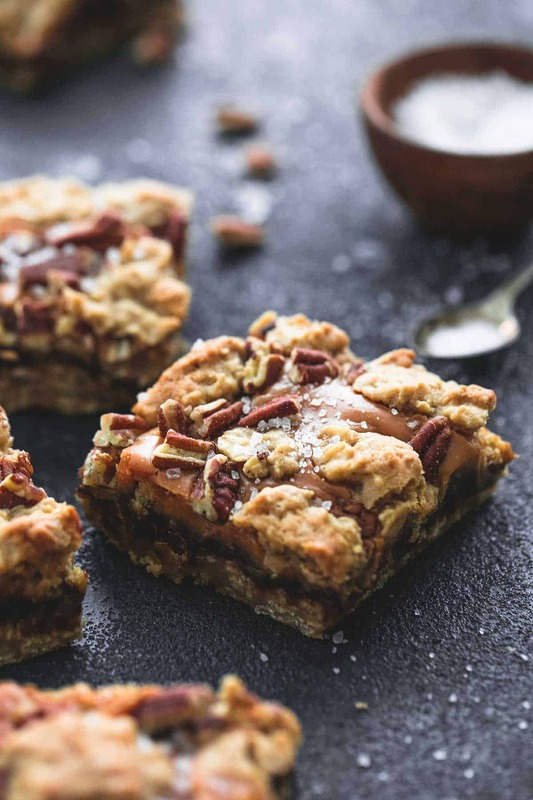 These bars look like the best combination of chewy, fudgy and chocolatey, with that sticky caramel layer. I still haven’t made blondies as I always seem to opt for brownies, but this variations sounds amazing <3 I really need to give them a chance sometime! Made these bars this weekend for my annual girls pool party, everyone loved them. I found they were better the day after I made them. These will be added to my go to list . Hi Alexandra! I’ve never tried freezing these before so I’m not sure if they would freeze well or not. If you try it let me know how it turns out!